Day One: Rice, Kasha, Vegetables, Butter. You need “old” rice to fry it; if you don’t make it in advance, you will likely end up with a sticky, lumpy mess…..so don’t try to cheat!! 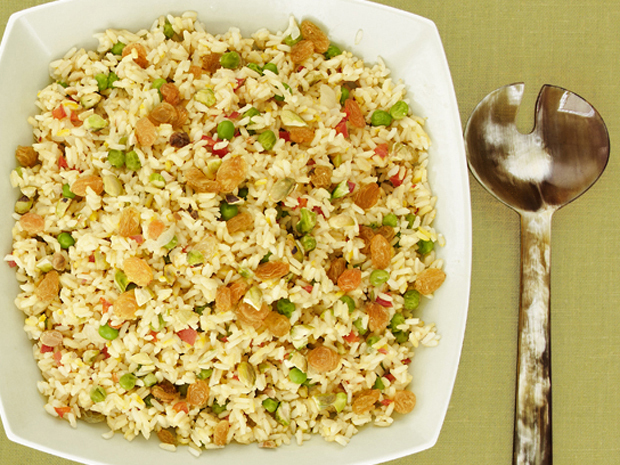 You could easily keep the rice in the fridge for 3 or 4 days, too –it won’t hurt anything– but overnight is the minimum! You can, of course, cook the rice however you feel comfortable; just use the chicken broth as your liquid (the rice I use takes 1.5 times as much liquid as dry rice, hence the amount of broth specified in the ingredients list…) and add the saffron, bay, cloves, and some ground pepper. The goal is separate grains, so that it will fry nicely later on. Melt half a stick of butter in a saucepot over medium/high heat, and add rice. Cook the rice for a few minutes, stirring constantly. The grains will begin to turn opaque; when you smell browned butter & popcorn (take care not to burn the butter!! ), add the chicken broth, bay, cloves, saffron, and a good amount of ground pepper. Keep on medium/high heat, lid off, and stir a few times. Let it come to a boil, stir again, and then watch for the rice to “rise” up to meet the top of the water. When you see the “bubble-channels” coming up in the same place, that’s good enough (hard to describe if you don’t normally cook rice this way, but it’ll make sense when you see it). Give it a nice stir, scraping the bottom. Put a wet dishcloth over the pan, smush the lid down tight, and turn the burner as low as it will go. Set a timer for 25 minutes, and don’t touch it. When the timer goes off, remove from heat and let it sit, covered, for 30 minutes. After that, taste-test just in case (i.e., is it cooked through), fluff with a fork and put it in the fridge. The only time I’ve had trouble with this method is when using a big, heavy enamel pot….then you can just cook a little longer, adding liquid as needed. **If you have a very tight fit on the lid, you can skip the dishcloth. It helps to ensure a tight seal. Beat the egg throughly in a medium saucepot. Add the kasha and stir it thoroughly. Place the pot over medium heat, and stir constantly. As the egg dries, the kasha will separate into individual grains (about 3 minutes). Remove from heat, and stir for another minute or so until it stops cooking. Set aside. In another medium saucepot, boil your 2 cups of beef broth along with a few tablespoons of butter. I like to add some dark soy sauce as well, just to make the kasha come out extra dark, but it’s not necessary. Once it is boiling, add the kasha, stir, cover, and simmer gently for 10 minutes. Taste to make sure it is soft, then fluff it up and refrigerate. Peel and chop your celery, carrots, and onions. I try for about 1/3 inch pieces, maybe a little bigger, on the celery and carrot. Maybe 1/2 inch pieces on the onions. Blanch the carrots and celery in very salty water, drain, and refrigerate (keep them separate). You could cook the onions now or the next day; but since they take a long time, you’d might as well do it now. In your biggest skillet, cook the onions down on medium heat until they’re cooked down, nicely caramelized, but not yet falling apart. Use as little butter as possible. Put a couple paper towels in a bowl and scoop the onions into it, then gently press with some more paper towels. Try to get some butter out but, don’t smush them. Refrigerate. While your onions are cooking down, melt 1/2 stick of butter in a small pan, add garlic, and let it steep over low heat for 20 minutes or so. Strain the garlic out and discard; refrigerate the butter. Day 2: Vegetables & Mushrooms, Rice, Orzo. In a big skillet or frying pan, sauté your celery in a little butter, until just done through. Add pepper and salt to taste. Refrigerate. Do the same with the carrots; get some nice browning but not falling apart. While they are cooking, slice up your mushrooms in whatever size you care for. Once carrots are out of the pan, put a good amount of butter in to melt, and add a little dip of garlic butter to taste. Saute the mushrooms over high heat; add some salt or soy sauce to taste when they have shrunk all the way down. While cooking your vegetables, boil the orzo in salted water (or broth, or whatever flavor you like) until done; drain and set aside. Use the biggest, heaviest skillet or frying pan you have. If it’s the same one you used for the vegetables, make sure you get it good and clean at this point. Take your rice out, fluff it up, and pick out the bay leaves & cloves. Get your pan nice and hot, and have butter, soy sauce (or very strong broth), and a glass of water (for “deglazing”) handy. When the pan is heated all the way, rub a small pat of butter around with your spatula, just enough to grease the pan, and dump in a batch of rice (maybe a layer 1.5 inches deep or so). Let it cook on high heat; break up big clumps of rice and spread it around but don’t try to stir it yet. When it sounds like it is cooking briskly, try scraping the bottom (use a metal spatula– or else a very stiff rubber one, with a good clean edge on it, if you are using an enameled pan). If the rice comes up easily, you’re good to go; stir it all up and repeat until most of the rice is browned and starting to get clumped up/sticking to pan. At that point, drizzle in some soy sauce/broth, followed by a dash of water (to thin out and spread the soy sauce if you are using it); stir immediately, and taste. You may need to add a little bit of butter to keep things going, but remember that the rice is already “greased” as it is. Use pepper, and the garlic butter as well, to your taste. Keep “seasoning” the rice this way until the flavor is agreeable and salty enough. If, by this time, the rice is dried out and too chewy and clumpy (it probably will be), dump in some water and stir until it steams off—repeat until the texture is right. Just before the last water boils off, turn the heat down. Scoop the rice into whatever you intend to serve/keep it in. If you time it right, all the little bits and starch residue will get swept up with the rice and your pan will still be smooth and ready for the next batch with a quick wipe from a paper towel. Now, while the pan is getting hot, dump your carrots and celery onto the hot rice to help get them started warming up. If you have a lot of rice still to fry (small pan, etc.) just pop into a warm (180F) oven; no need to cover. Fry another batch, and keep going until you only have a little bit of rice left. For this last bit, add the herbs (if you are using) to a smidge of butter, cook briefly, then add the last rice, the kasha, the mushrooms, and the onions. This way all those ingredients will separate & be much easier to stir into the bulk of the rice –particularly the onions. Once this last batch is heated through, stir it in with the rest and the orzo and keep in a warm oven. **If you want, you can use olive oil instead of butter….but the texture is inferior. If you use a well-seasoned iron skillet and high heat (or if you absolutely must, a non-stick skillet! ), you will use lot less butter than you might expect. **Variations: add any of the following: almonds, leeks, ground lamb, diced ham or bacon, kielbasa……etc.